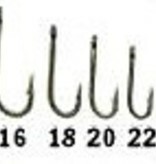 A straight eyed dry fly hook with a wider gap than the standard dry. This hook is ideally suited for smaller fly patterns. It rides low on the waters surface making it a good choice for spinners and comparaduns.